The problem with this `traditional' approach to scooter tuning is that it relies on the original exhaust system being fairly poor in terms of outright performance. 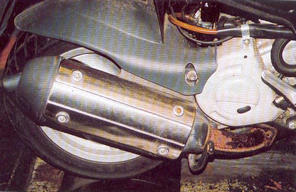 The performance of those fitted as standard on older scooters or restricted machines, can often be significantly improved upon by the application of a specially designed expansion chamber. The thing with the Runner 180 engine is that is is not restricted to comply with any law other than emissions and noise legislation and thanks to sophisticated computer-aided exhaust design technology, the original exhaust is very efficient. 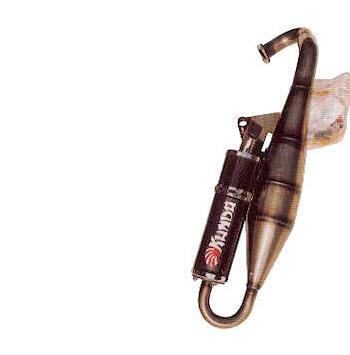 We know from the experimentation of British tuners such as PM Tuning and Taffspeed, that trying to build a pipe that would out-perform the original exhaust was no easy matter. Paul from PM Tuning admitted that after building a huge number of unsatisfactory prototypes he came close to giving up, before he found something that gave a worthwhile improvement. All this made us very suspicious about the many foreign exhausts appearing on the British market. Had the manufacturers put in the same evelopment effort as Paul, or were many of them simply trying to sell pipes that are really for the 125cc Piaggio machines and don't neccessarily work on the 180? The only way tofind out was to get as many as possible together and hold a big dyno shoot-out. Hey Presto, what have we here. Taffspeed were chosen as a suitable venue for the test; Not only could they supply many of the test systems from stock, but also because they had a bog. standard Mk1Runner180 on which to try them. All the pipes were tested on the same machine on the same day. No modifications were made to the machine unless stipulated by the manufacturer. Each time an exhaust was fitted the engine was accelerated from 20 mph to 90mph several times until a consistent curve was produced. Once we were happy that the transmission and exhaust were at working temperature, the scooter was run at full-throttle from standstill to over 80 mph. 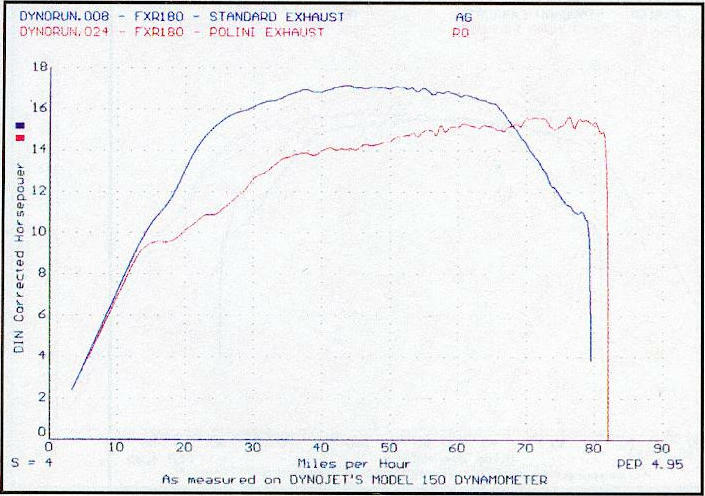 The resulting graphs therefore Show the power output of the engine compared to road speed. 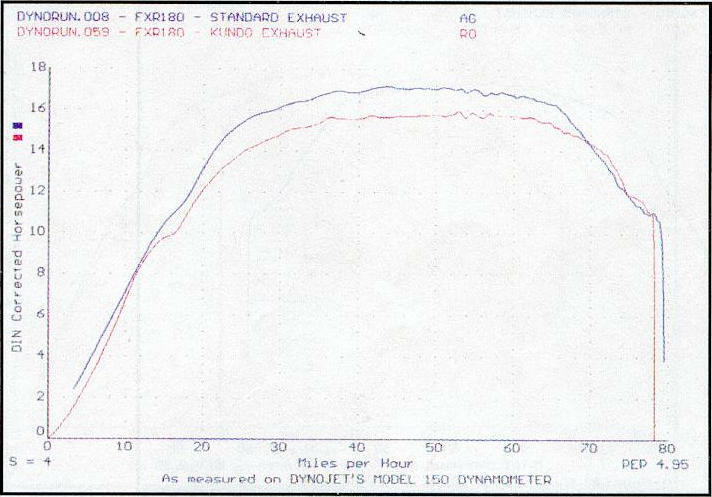 Most standard machines with less miles under their belts (sic) put out between 16and 17 hp, but this figure tends to me after a few thousand miles, the basic performance of our test machine was actually very healthy, with a smooth flattopped curve that touched a peak output of 17.2 hp at the rear wheel. 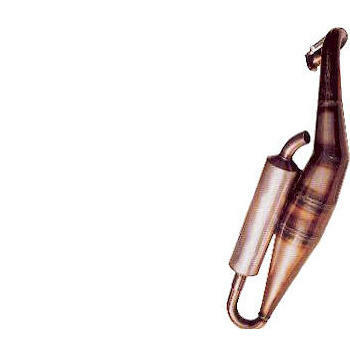 V.E Spares are distributing these as a V.E. but it is at least cheaper.